The list of job descriptions today that didn’t exist back when you were in school keeps getting longer. The job of Social Media Community Manager is one of them. Companies started up Facebook pages, Twitter feeds, YouTube channels, blogs and web forums because they were cheap and easy… only it turned out that it wasn’t so cheap or easy to manage and maintain them after all. Social media, when done right, is time-consuming. Chances are, the marketing manager or web guy already has a full plate of responsibilities, so the question arose: who’s going to be in charge of this? Enter the Community Manager. Often, it’s someone with extra time to monitor and manage social channels. Increasingly, companies are realising that the low-paid intern is not the best person for this critical job, and are hiring professionals or self-styled experts. Some community managers are in-house full-time employees; others are freelancers who are hired on contract. 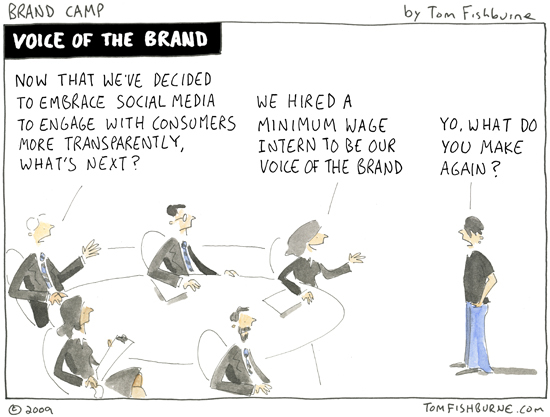 The job of the Community Manager is to “engage” in social media spaces. Roughly, this translates into posting content to feeds, monitoring, replying and responding to things posted by the community members or the public at large, and keeping tabs on stats and metrics. Sometimes, though not always, community management includes customer service. Often, there’s an element of risk management or crisis management to the role, too. 1. Be real. So you’re been hired to community manage. You’re probably tempted to hide your true identity – and maybe even the fact that you are a gun-for-hire – under a generic, corporate identity. Resist that temptation. Don’t be afraid to be a real person under that alias, and to let your personality shine through. People don’t want to connect to corporate “brands”; they want to connect to other people. You’ve been hired for your unique voice, so – within the parameters and guidelines of your brand – don’t be afraid to use it. 2. Be unique. There was a famous Royal Canadian Air Farce skit from the mid-90s in which a call centre agent in India juggles calls for an airline lost luggage service, an alarm company, a computer tech support centre, and a pizza delivery line, among other things. The modern-day equivalent is the community manager-for-hire, who manages social media properties for a number of different companies at the same time. As a result, sometimes you’ll see almost the exact same post for two or three different pages you’re subscribed to appearing at the same time of day. It may be tempting, if you find a winning community management formula, to repackage it with only slight variations for all your clients. Remember, though, that there could be significant audience overlap, and people don’t want to see the same posts in rapid succession from different brands. Make the extra effort to find a unique strategy and voice for each brand or community that you manage. 3. Target your content. That means that if you’re the community manager for a band, don’t send out mass invites to a show in Atlanta to people living in San Diego. If there’s a contest or promotion that isn’t open to residents of Quebec, filter them out of your update post. Use Facebook’s geographic targeting options instead. If you’re community managing a bilingual page, don’t post everything in English and French; instead, use the language targeting feature to post to each. If you’re posting video content that is unavailable outside the USA, don’t post it to people who can’t access it. If you manage multiple Twitter feeds, don’t cross-Tweet or retweet from one feed to the other. Take the extra second to target, and you’ll spamming people’s already-cluttered feeds… and lessen the chances of them clicking you off. 4. Don’t feed the trolls. Spammers, link-baiters, trolls and flamers can ruin the great vibe of a community faster than you can detect them. Engaging in a war with these folks is a lose-lose situation. Establish clear guidelines at the outset for each community, which state what you will and won’t accept on your page, and then follow them. At the very least, ignore these posts. If they start to cross the line over to abusive or spammy, delete them or ban the users. Remember that it’s your job not only to post and engage, but to moderate and to know when to disengage. 5. Ask for help. If a contentious issue arises, or there’s a question from a user that you don’t know how to answer, send it up the food chain to the appropriate person in the company who can help you out. If this means delaying your response, just say so – tell the person that you’re checking and you’ll get back to them as soon as possible. Refer people to those who can best help them out. It’s not your job to know everything; it is your job to know what you don’t know, and to ask for help when you need it. Ideally, your job or role description should include some sort of process map displaying when and who to ask for help, and setting out response time standards. If not, take the initiative and draw one up yourself, and get it approved. This will prevent a lot of ambiguity later on. 6. Consider not using a community manager at all. True, it’s time-consuming to manage your own social channels, and it’s not always realistic or practical for every company or brand. But people don’t want to be friends with “generic community manager”; they want to be friends with YOU. If you prioritize social media as one of your key responsibilities, whether you’re a CEO or a start-up owner or a Grammy-winning recording artist, genuine authenticity almost always beats out gun-for-hire. Be realistic about the time commitment that it requires, but think about doing it yourself. The upside potential is limitless. Can fun and marketing coexist? Previous PostPrevious Is it time to redefine ‘fair use’?